It has been hypothesized that endothelial dysfunction and pelvic atherosclerosis may contribute to lower urinary tract symptoms (LUTS). We assessed the relationship between cardiovascular risk factors and LUTS severity in male patients presented to urology clinic. It is a cross-sectional study on patients who presented between 2013 and 2015 with LUTS. 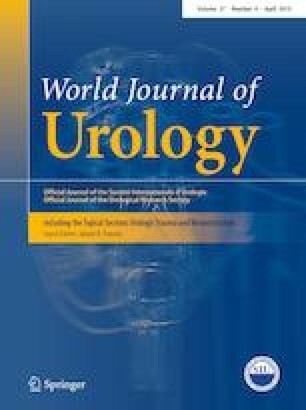 A total of 1176 male patients were encountered, and 966 were included for analysis after excluding patients with urinary tract malignancy, urethral stricture, bladder stone and history of urinary tract surgery. Cardiovascular risk factors including components of Framingham risk score, body mass index, uroflowmetry, International Prostate Symptoms Score, fasting blood glucose and serum prostate-specific antigen (PSA) were assessed. Correlation between Framingham risk score, cardiovascular risk factors and severity of LUTS was investigated. Multinomial logistic regression analysis showed that severe LUTS significantly associated with Framingham score (P = 0.008) and its components of total cholesterol (OR = 1.318; P = 0.010) and age (OR = 1.032; P = 0.006) compare with mild symptoms. Framingham risk score was found to correlate with storage symptoms (CC = 0.083; P < 0.0001) but not voiding symptoms (CC = − 0.029; P = 0.185). Severity of LUTS and storage symptom significantly increases Framingham risk score, particularly with the components of total cholesterol level and age. CHY: Protocol, project development, data collection, data analysis, manuscript writing. JSYY: Protocol, project development, data collection, data analysis, manuscript writing. NMYC: Project development, data collection. CHK: Project development, data collection. KML: Project development, data collection. JYCT: Project development, data collection. PKFC: Project development, data collection. JHMW: Project development, data collection. ESYC: Project development, data collection. CKC: Project development, data collection. SSMH: Project development, data collection. CFN: Project development, data collection.